This was the display at their party table. I’m totally not a camo girl, but I really loved the way they tied their pure-bred countryness into their big day and softened it with a pretty shade of pink. The antlers were special to Shane because they were his fathers. I also feel like they totally tied the composition together (do you call it “composition” if it’s a real life display?). I think they added such a whimsical and almost surreal quality with the juxtaposition of soft femininity and ruggedness of their décor. Two weeks ago, I had the privilege of shooting my first wedding for a friend I worked with a while back. It was a horrible call center job, but that is irrelevant. Anyway, Andrea is awesome. She and I had at that time both been in long-term relationships, and were both getting a bit antsy and often talked about it together 🙂 So when she messaged me and asked me about doing the photography for their wedding one day after OUR one year anniversary, I was super excited! Andrea and Shane are a perfectly matched couple in every way. They’re both down to earth and quite on the country side. 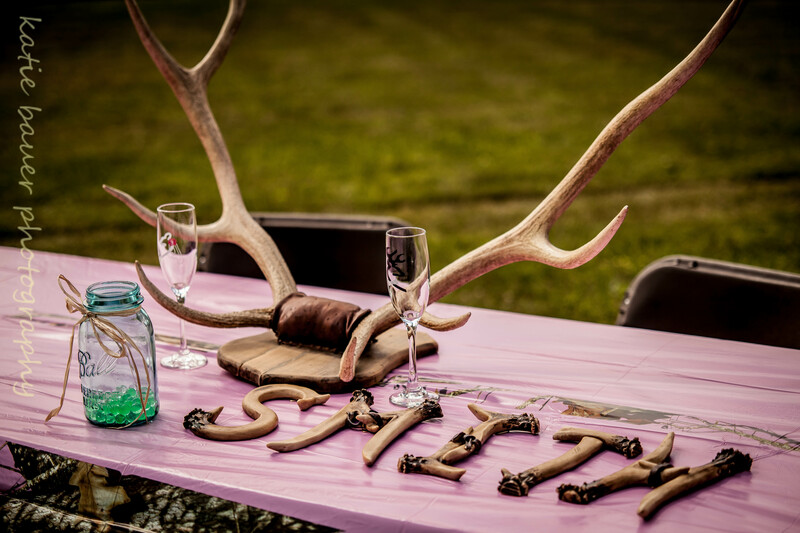 They even had camo and their own deer’s head emblem incorporated into their wedding! You’ll totally see what I mean in the photos. Very much like my wedding (although with a TOTALLY different visual outcome), Andrea and Shane’s was a huge DIY project, and they did a WONDERFUL job pulling it off! Andrea made those drop-dead GORGEOUS bouquets. I LOVED the addition of the big fluffy feathers! Her dress was super edgy- stark white with black designs on the top. She had purple and pink stripes in those gorgeous curls… Basically, she looked like an absolute rock star. Shane sported a camo shirt complete with a little pink boutineer to drive the camo theme home… and the bridesmaids! Amazing choices on the dresses- they all looked beautiful! I’m really big on varying styles of bridesmaids dresses rather than all one style, and these were all to die for! And her uncle’s band rocked all of the music- think “Here Comes the Bride” on a Fender Stratocaster.. and nearly dead on covers of tons of classic rock songs for the reception-yep, it was awesome. I think my favorite part of their decor were the deer antlers. First of all, because I’m a total sucker for adding iconic meaning and honoring treasured family members throughout special events. Shane is a deer hunter, and the large set was from his father, who he lost when he was five years old. Displaying something passed on from a loved one at the most important day of ones life is the ultimate way of paying respect to them, and I thought it was so sweet. Secondly, I think the antlers added such a surreal quality to a lot of the photos- and that crazy sun with intermittent clouds we had really added to that! Speaking of sun… the sun was a bride’s dream and a photographer’s nightmare that afternoon. Luckily when the gorgeous golden evening glow that is the result of a bright, sunny day kicked in, I was able to take advantage of it and create some pretty crazy sun flares! I might have actually gotten a bit carried away with the flares, but I absolutely love the photos I got of the bouquet toss. I think they totally reiterate the fun and excited atmosphere that filled that day… you’ll see. My wonderful dad helped me shoot this one. I really love shooting with him! Seriously… he’s the coolest guy ever, and he’s got such an eye. He had a lot of fun, and I had a great time with him there. I’m sure he enjoyed the father of the bride’s GORGEOUS ’67 Chevelle, considering he had a ’69 before I was born (and I was SO UPSET as a child to learn he had one but I wasn’t around to enjoy it). I couldn’t help but sneak off when I got the chance to snap some shots of the car. Anyway, here are the photos of Shane and Andrea’s absolutely unique wedding! What an awesome day! I think this is super cute. I really love candid photos. I think they add so much of a “real life” quality, and I think people look their best in a natural state. You can see how much fun and happiness everyone was experiencing! I really love this one too. It was actually taken by my dad, who was acting as my second shooter. Pure gorgeousness, right here. I’ve had a weakness for classic cars since I was a kid. Paige, their adorable flower girl! The bride’s parents walking her to her VERY soon-to-be husband. MY GOODNESS Andrea looked beautiful! Those colors in her pretty curls and her rocking dress were just perfect. So her. Being presented for the first time as husband and wife! They had a beautiful weeping willow in the front yard. Little do many people know that there were TONS of cars parked around it! I really would have loved getting some wide shots, but I think she looks gorgeous here. SO CUTE! The antlers were also a great prop. Okay, this almost looks like a Wonderland tea party or something.. They even had camo rings! Theme was tied into all of the details! 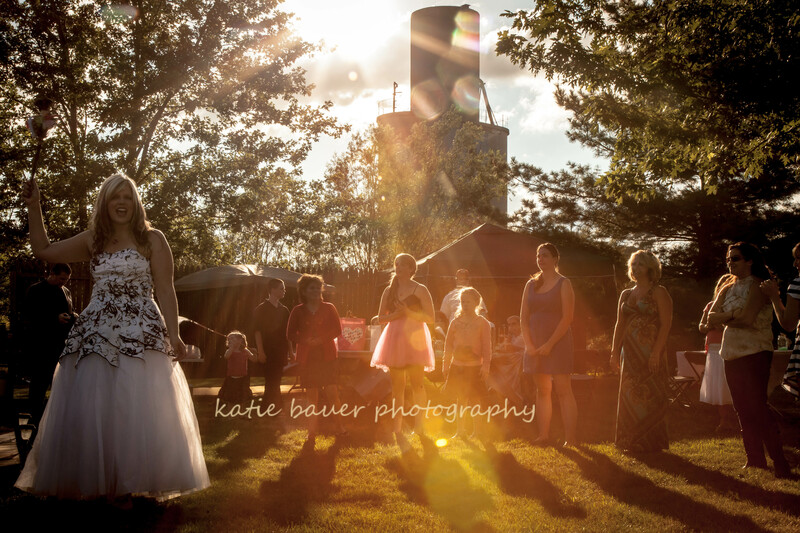 NEARLY perfect timing… the bouquet was just past the sun when I snapped the photo.